Upper Deck decides to follow Topps' lead with O-Pee-Chee Platinum. This product has the look and feel of Topps Chrome. It's a set that takes a low-end set and puts some glitz on it to make it more premium. Chrome is a very successful product in other sports. Will OPC Platinum follow the same path as Chrome? 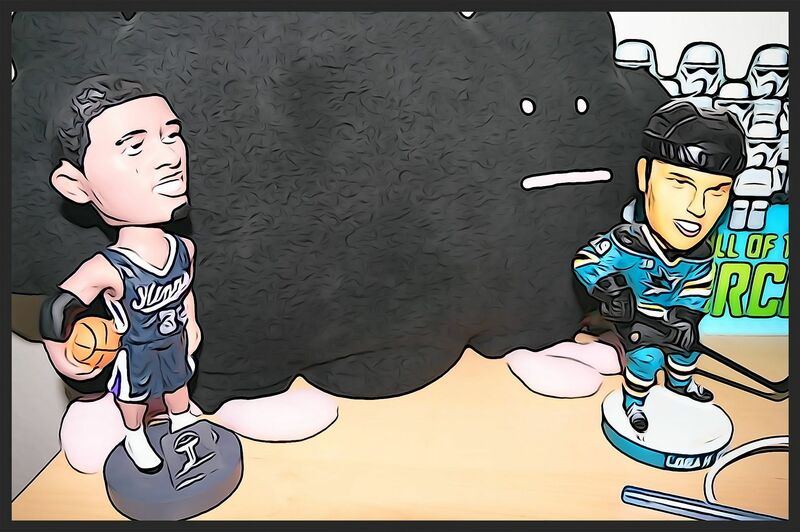 We'll just have to see how the hockey collectors respond! The OPC Platinum cards share basically the same design as the regular cardboard-feeling O-Pee-Chee cards released earlier this season. The difference is in the chrome foiling that adorns the front and the glossy backs. The foil used here is different than the foil cards found in the regular OPC set. Those foil cards were thin and had a harsh reflection to them. These cards have a very smooth sheen. The cards look very nice. I've always liked it when card companies took their basic designs and stepped them up with foil. That's exactly what Upper Deck has done here with OPC. The result definitely works well! The back of the base card is very glossy with an all-white background. It's very clean and tidy. I do, however, miss the cardboard feel and look that the OPC cards had. Is it possible to have that same feel or look but with gloss? I think that would make for a very unique kind of card design. Rookie cards in OPC Platinum don't get the different subset look here. 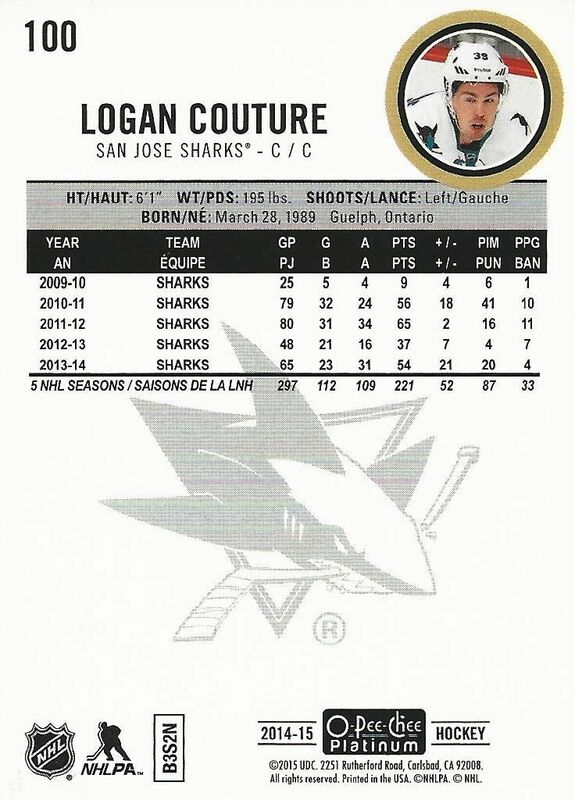 These rookie cards simply have have RC logo in a circle under the rookie's name. 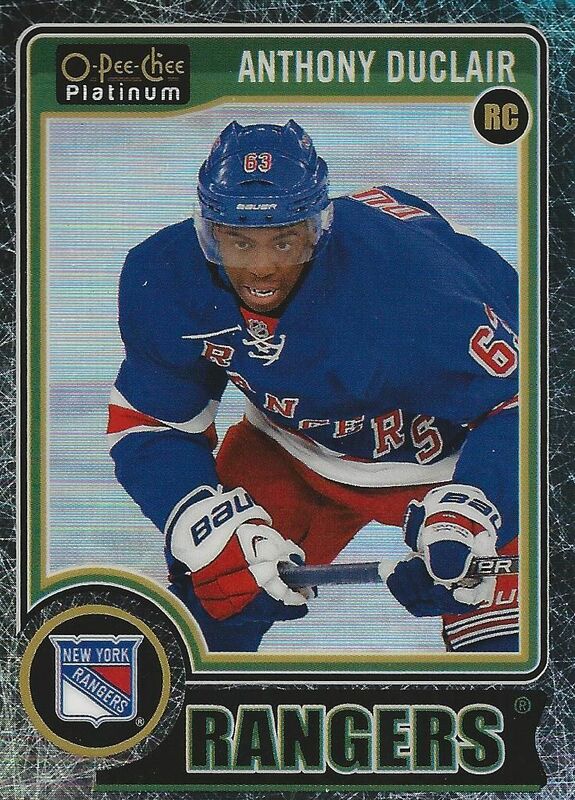 I wonder why Upper Deck chose to make the rookie cards look more like the base cards. It makes them stand out a bit less... but that's actually a good thing in my opinion. I like rookie cards that look just like the base. That's how it used to be! Funny how the more modern OPC looking set utilizes a more retro concept than the standard version. Each box of OPC Platinum comes with 20 packs with only 4 cards per pack. Collectors can expect to find one autographed card per box. Most of the interest will be with the numerous colored variations of the base set. The most common OPC Rainbow parallel are the ones that just have a multi-colored sheen on the card. These cards very much resemble Topps Refractor cards. In fact, they are so similar it is hard not to call them Refractors. 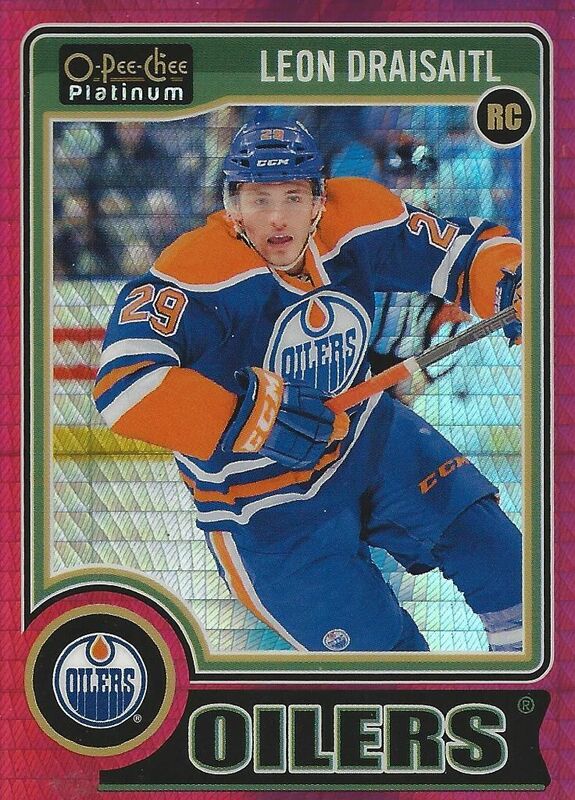 These Rainbow cards look really nice - collectors have always been charmed by this type of card. It's no wonder card companies produce so many of them. OPC Trax parallels are non-serial numbered parallel cards like the standard Rainbows. These cards have a more intricate design and are about twice as hard to get as the Rainbow cards. 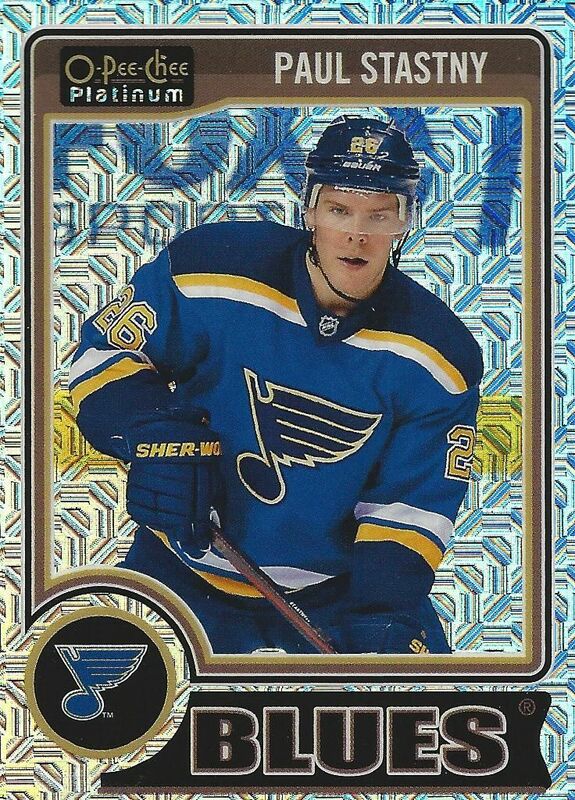 This Paul Stastny was the only Trax card I pulled from my box. I got three Red Prism parallels in my box. These parallels do feature serial numbering... to 135. These red bordered cards remind me a lot of the red parallels from the standard set. The texturing on the foil isn't as apparent on these cards. It's definitely there, but it's more subdued. 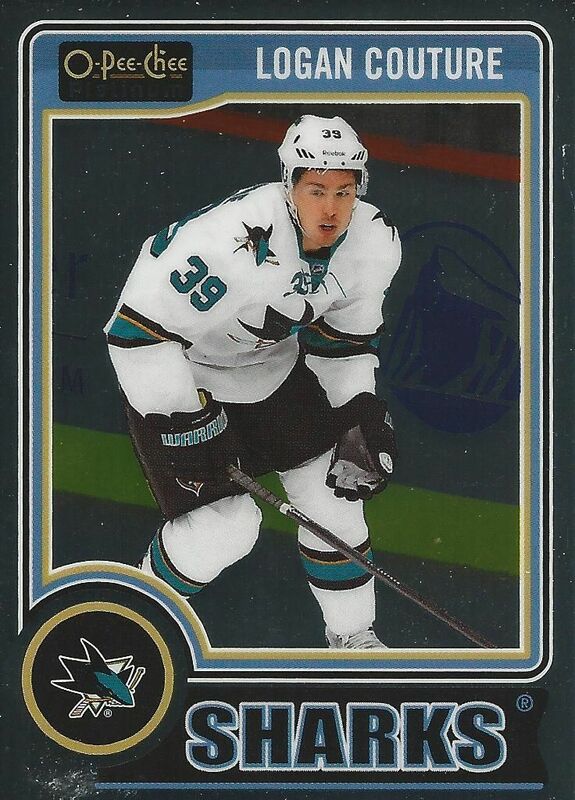 The lowest serial-numbered card in my box was this Black Ice Rainbow parallel numbered to just 25. Here the border of the card has been darkened to black, but with clear streaks in it to resemble the ice. Retro cards have made their way to Platinum as well. These cards definitely don't translate well to the chrome format. These cards may have worked as standard cards with fun colored borders, but as foil cards, they hardly seem retro - neither in look nor feel. Upper Deck should have definitely chosen a better design for this retro set. Retro Rainbow parallel cards also exist. These come in a variety of variations just like the non-retro basic set does. If you want to collect a certain player in the set, you're going to have quite the time tracking all these different variations down. Clocking in at about one-per-box are die-cut cards. 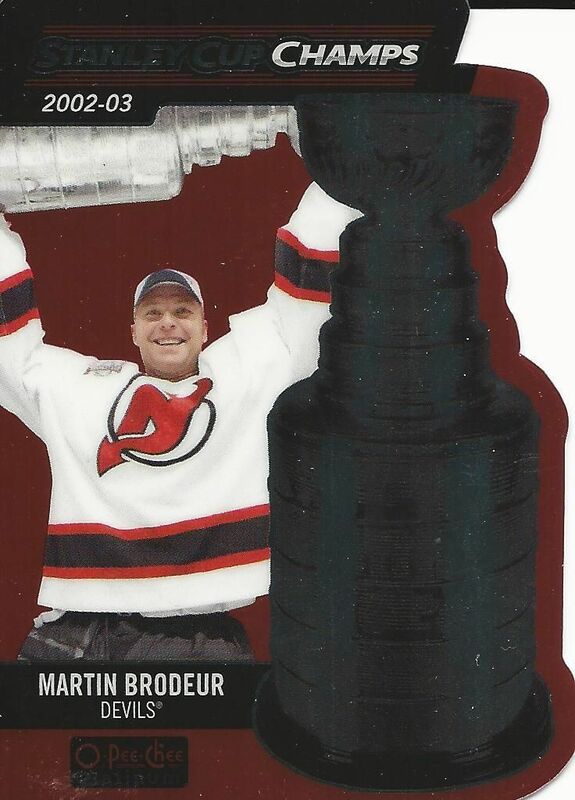 There are different kinds available, but the one I got was of Martin Brodeur celebrating his 02/03 Stanley Cup victory. Having the card cut like the side of the Stanley Cup was a great idea and works nicely. The one hit in the box was of rookie Calle Jarnkrok of the Preds. These autographed cards are on-card and in blue ink. The design of the card mirrors the standard rookie card from the base set... but with a different image. These cards a well-done and a nice pull from a box. OPC Platinum boasts more parallels, including very rare one-of-one cards. The set is dependent on collectors trying to find all the parallel cards. It's nice of Upper Deck to at least include an autographed card though... we need our hits! 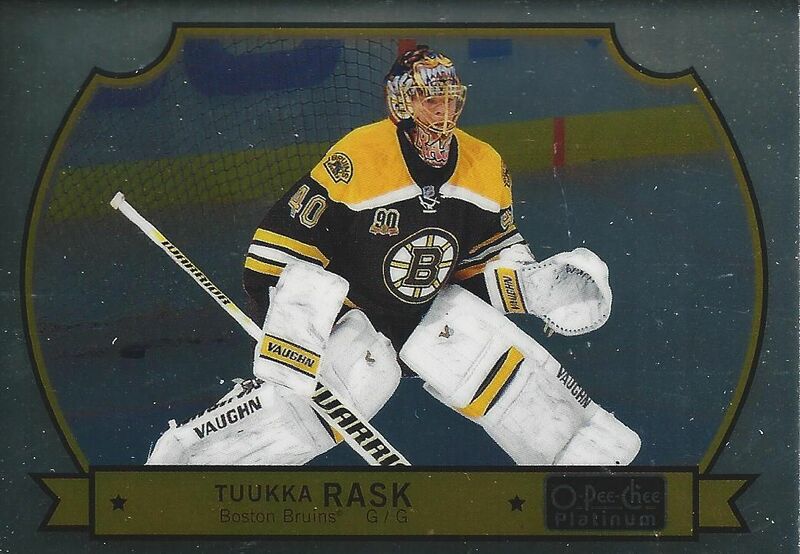 OPC Platinum is an interesting set to bring into the hockey card fold. I definitely see why they have it though... it is trying to get the same success as Chrome from Topps. The box was fun enough to open, and it was neat seeing all the colors come out. 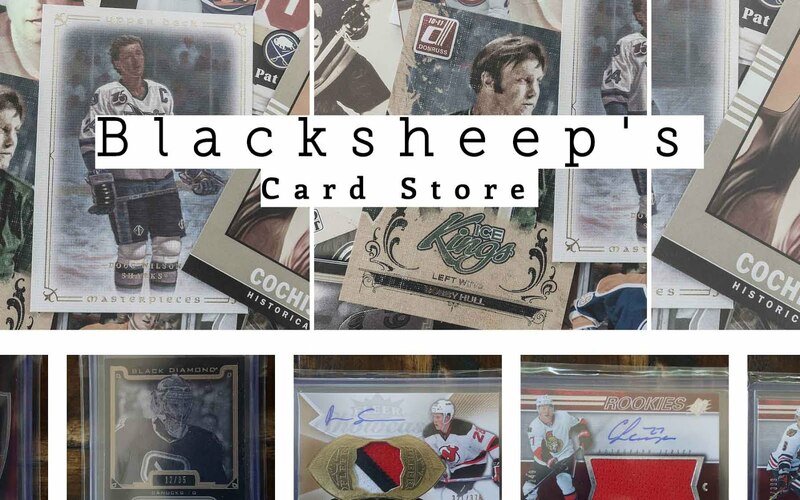 Hockey collectors have never been into parallel cards as much as baseball and basketball collectors. It just makes me wonder if these parallels will every become desired pulls. Boxes of Platinum come in at under $100, so it's not a high-end product. The only way to drive these prices up is for collectors to switch on their parallel wanting desires. It'd be great if a set like this could take off, but I'm not sure if the hockey collecting world is willing to help it do that. I would definitely get a box or two of OPC Platinum to experience it. For player collectors, the best bet is to scour eBay for the cards you need. Nice cards, but I don't think you usually make your money back on a box. I really liked this product so far. After one box, I really want to buy another. Love the look of them and the rookie autographs are really neat! 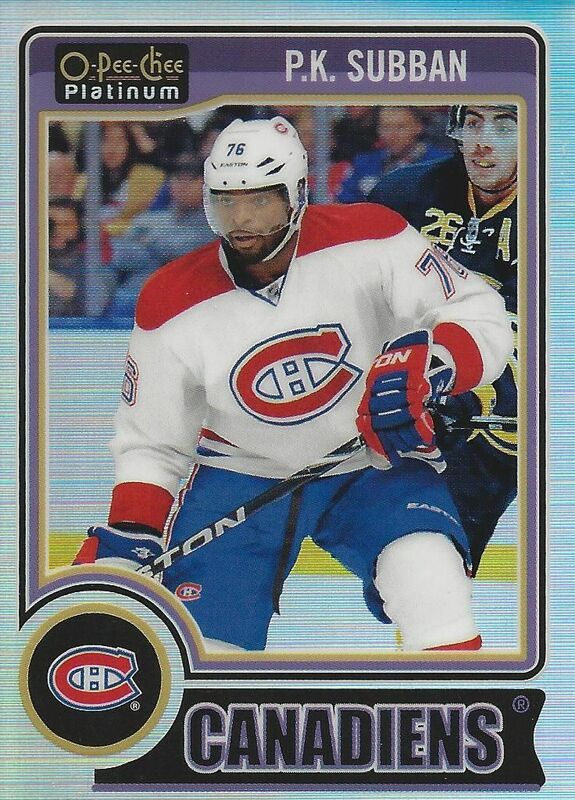 I snagged a Blue Rainbow Darnell Nurse 17/25. As an Oiler fan I was so hyped about it! The shininess of the product took a bit of time to get used to (since their sneak peek post on Facebook to actually breaking the product). 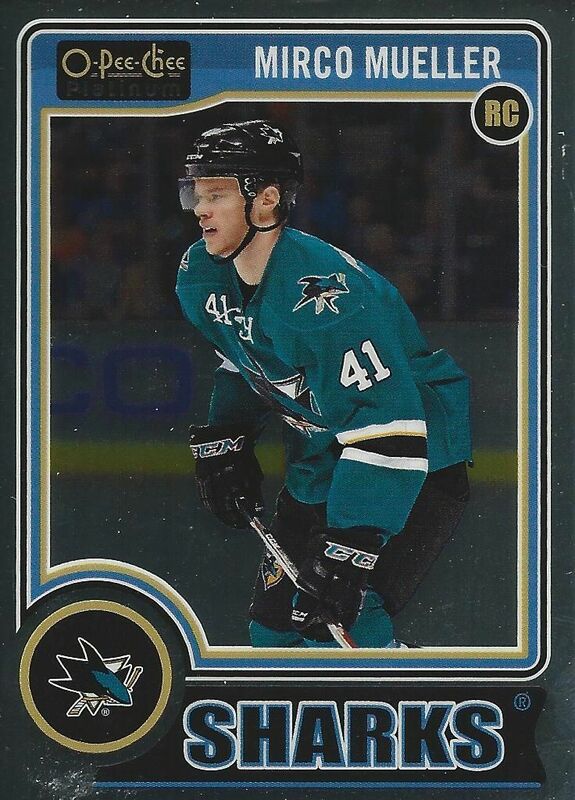 There was certainly a nice mix of non- and numbered parallels that should draw up some interest in the secondary market but as you mentioned, it isn't as apparent with hockey collectors. Nice Brodeur die-cut hit from your box Luke! I'm impartial to shiny cards. 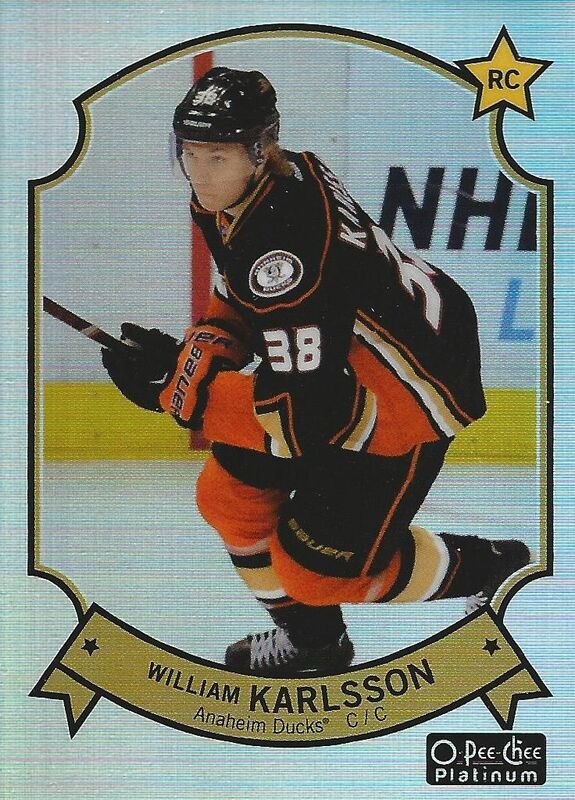 This product reminds me of the Panini Select Hockey, which I disliked b/c the sticker autos looked bad on the shiny surface. Props to UpperDeck for making this an all on card auto product. I was wondering, if you win the contest, how do you PM you? Best box I've seen been broken! I think Upper Deck did a wonderful job with this product. I love all the parallels because it gives every player in the set a cool rainbow, one bigger than seen in most Upper Deck products, that has a decent range of rarity. I think the price point for the product is perfect for the amount of stuff your getting and is both affordable and desirable. NEAT box I was also wondering how we can PM you if I win the contest? I find that the various parallels look great! However, 4 cards per pack? I usually buy packs instead of entire boxes and I think I'll have to pass on this one since I don't want to pay like 10$ for a refractor card. Nice break! That Duclair is sick !! Nice product ! I love all the parallel and everything! Nice review too !! Pretty sweet Box! I'm thinking about buying it myself. Looks like a pretty interesting box! I LOVE COLORS! The parallel cards look really sweet! Cool product. Nice looking base and the different parallers look great, especially the blue box look awesome. With that many variations this product might give a headache for player collectors trying to get all versions. Thanks for the video and review. + On card autos on foil cards. I like it! + Some colour parallells do look really well. - Almost every card back seem to be way to boring. - I didn't even realize that the retro cards were retro cards until now. Instead it just feels like an ugly insert set. 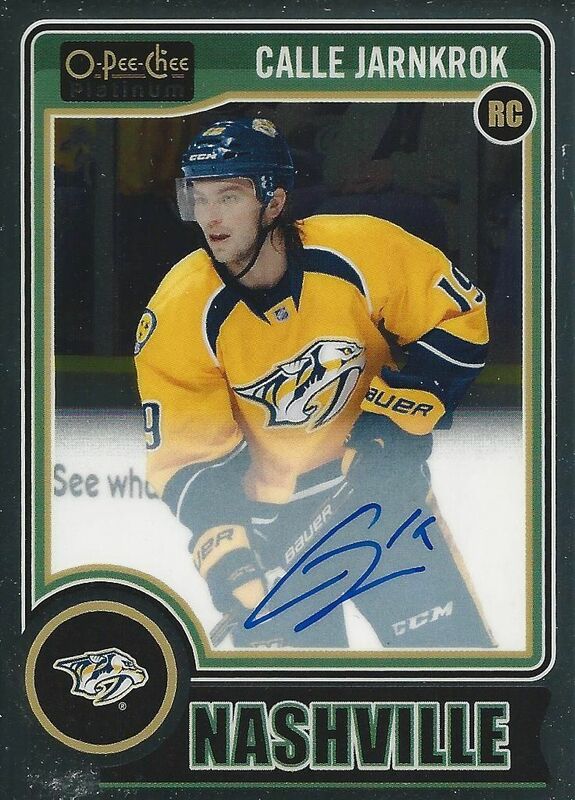 Jarnkrok is good, great oncard auto! I actually really like this product! I like how many insert and refractors you get per box! I love the product hit a johnny Hockey auto blue /25 in my box lol! Congrats on the duclar /25 nice card. ya this stuffs pretty rough on the re-sale market not a great product. Definitely an interesting box! Cards look nice but I am not sure if I will buy this one. Thanks for the review. I really like the aspect of the colors (inserts) makes up for only one hit auto in a box. I would pay the price for a box to have a shot to hit a nice colored auto. Nice video keep reviewing. HAPPY EASTER!!!!!!! Base cards are nice and I love the look of those parallels! Great Parallels and the colouring of the cards is amazing! 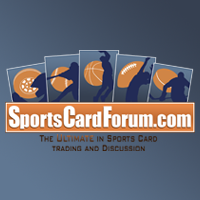 I'm a new subscriber, keep up the great reviews and breaks! I don't really like the lack of hits in this box. Just got two packs of that for Easter ,Great review!